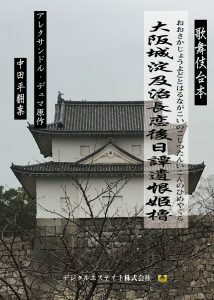 Castle of Osaka, the tower of princesses of rancor; The sequel to the love of Yodo and Harunaga | Digitalestate Inc. Please enjoy “Castle of Osaka, the tower of princesses of rancor; The sequel to the love of Yodo and Harunaga” in preview. At the time of Momoyama (1573 – 1603). Hideyoshi Toyotomi built the castle of Osaka floating in the Yodogawa River, at the corner of which there is the tower of princesses prohibited to men. In the city around the castle of Osaka, inside the tavern of Saizo near the sanctuary Morinomiya. Among the workers who are casting the corpse of a strange drowned man on the bank of the river, Hinosuke Tachihara, a young samurai who has just come to Osaka, is writing a letter to Tokinosuke Sumiyoshi, his best friend. Through the intervention of the hand of Harunaga who came by chance to the place where the quarrel between the workers and angry Hinosuke by listening that they called Tokinosuke the orphan, he ended up drawing . When the preparation of the entrance to the castle of Lord Kanpaku (chief adviser of the emperor) is underway, two bodies drowned were launched again on the shore. When Yodo calls a diviner in front of the castle gate for divination, he predicts the death after three days of Prime Minister Yasunojo Marukawa. To Tokinosuke, he asserts that one of the means is Hinosuke himself. In addition, he reveals to Yodo that she is a criminal who killed Hinosuke. He passed to Tokinosuke the paper that Hinosuke killed there wrote the name of the real culprit by blood. Harunaga disguised as a diviner wants to fulfill the ambition of being prime minister and dominate the state with Yodo taking advantage of paper as a threat. Osaka Castle remains closed even at the time of the open door. Harunaga followed by his samurai introduces himself and reads out the instruction manual to compel Yasunojo Marukawa. Harunaga, struck by the noble character of Maruyama who is arrested, is arrested in his turn. Harunaga is tied with the rope in the prison. Yodo comes to taste her victory. Harunaga wants to listen to the old story by her at the last moment. After he finished, Harunaga managed to get out of the prison and climb to the position after Kanpaku. Against Yodo who persists Tokinosuke, Harunaga makes the last bet. He promises to rid her cares from Yodo by turning over the letter, if she sees herself with him in the tower of the princesses. Yodo commands the servant to kill anyone who enters the tower. On the other hand, Harunaga orders to Maekawa the arrest of everyone who is in the tower in wanting the fall of the Yodo. When Yodo in the tower orders the murder of the one who comes to the assignation, Harunaga invades through the window rather than the entrance. When Harunaga reveals that Tokinosuke is their own child, Yodogimi becomes distraught.